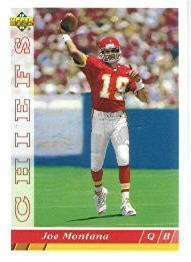 Bases Loaded Baseball Cards Item: 336811 -- 1993 Upper Deck Joe Montana Football Card #460 - Shipped In Protective Display Case! 1993 Upper Deck Joe Montana Football Card #460 - Shipped In Protective Display Case! 1993 Upper Deck Joe MontanaFootball Card #460 - Shipped In Protective Display Case!